Simply Made with Love…a Giveaway! Happy Monday Everyone! You are in for a special surprise today! The lovely and talented Leah from Everyday Love is giving away one lucky The Girl in the Red Shoes reader a $25 shop credit to her shop, Simply Made With Love!!!! 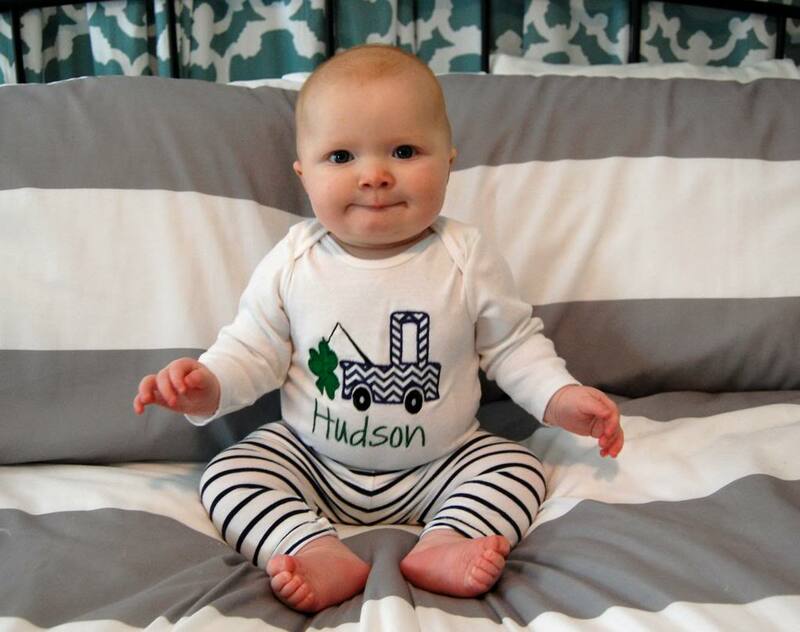 Leah makes personalized items for little ones….doesn’t Hudson look so precious in his St. Patrick’s day tow truck onesie? 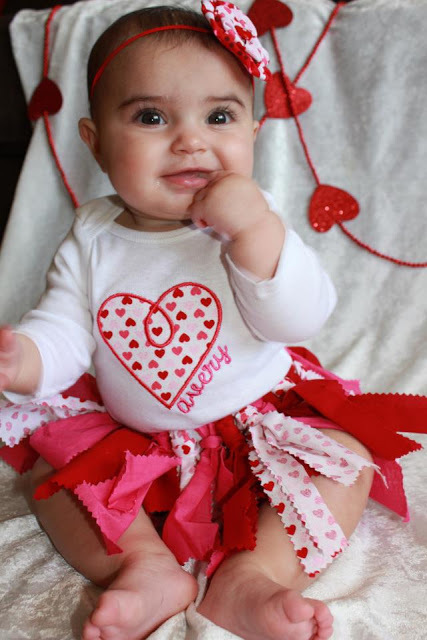 Leah was also the mastermind behind his super cute Valentine’s day outfit too! Whenever he wears this people are always complimenting him and asking where it’s from. I love Leah’s shop because I know that Hudson will have something special to wear that isn’t just like every other kid in daycare! Leah’s precious Avery all decked out in a onesie, skirt, and headband her mama made her. She’s one lucky little girl! 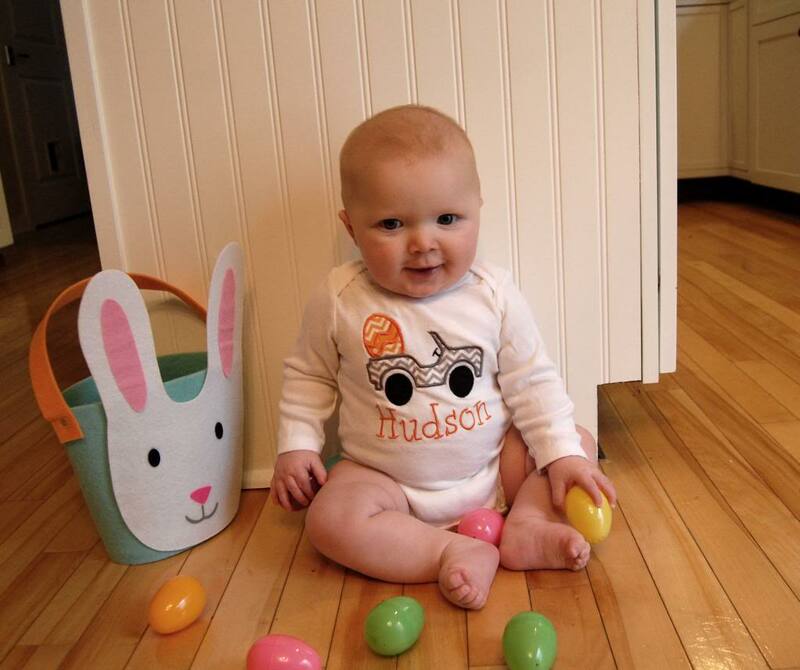 Leah also sent Hudson a onesie to wear for Easter…..dying over the cuteness! Look at the other Easter options….the bunny is just too cute for words. Leah also makes burp cloths, tag blankets, headbands, bows….the options are endless. Wouldn’t this make a cute gift for a baby shower? Enter below for a chance to win $25 from Simply Made With Love….and make sure you visit her facebook page! The winner will be announced next Monday. « Happy 6 Months Hudson! Love Leah! And of course all of Hudson's outfitsl. Too cute! I love her headbands, especially the lace interchangeable ones! The chevron bunny applique is precious! Adore the Easter Bunney onesie! Such a fun giveaway!! Those are so cute!! I am having a baby boy at the end of June! I can't wait to order some of these!! I love it all too! Oh my goodness it would be so hard not to get it all!!! Thanks for the chance. i love the tow truck onesie hudson is wearing! I love the bunny one's. So adorable for Easter! I love the heart with the mustache!! Everything she has is so cute!! Love everything! i am obsessed with anything monogrammed! i love all the valentines day heart products!! Some people are just so talented! I'm always blown away. These are too adorable! The perfect baby shower gifts for sure. Love the giveaway- after I saw Hudson in his Valentine's day onesie I immediately went to her website -the outfits are too cute! I want one for every holiday but I was thinking of getting my little boy one for his baptism! 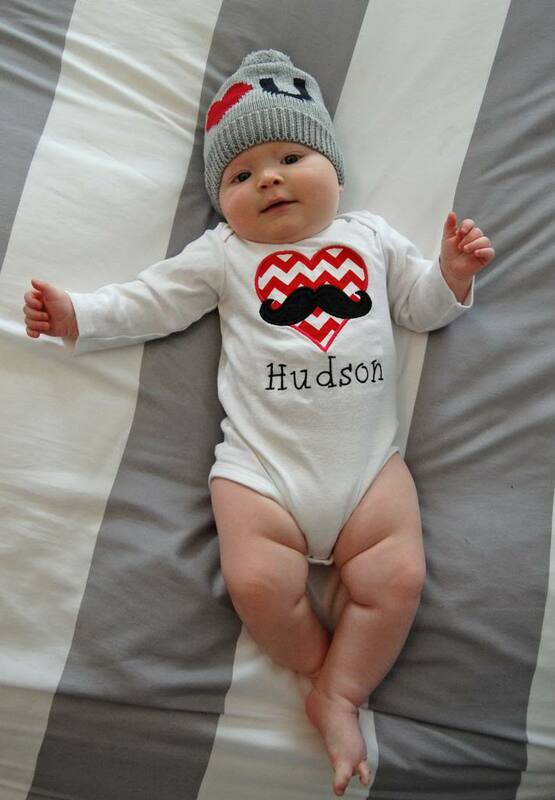 Oh my goodness – Hudson is TOO CUTE! Love those sweet, chubby cheeks! Leah's designs are adorable, she's such a sweetheart! OMG I absolutely love the Easter outfits, Jett is so getting one regardless of whether I win or not! omg these are all just so cute! how do you choose? choose them all of course! 🙂 hudson just gets cuter by the day! i would love to put my little chunker in the heart onesie! I love Simply Made! My favorite is the Shamrock t-shirt I ordered from Leah for my son Owen. Such great quality and great service! Not bad prices either! I love the Easter Egg Applique and the Easter Bunny Applique. Course I would also get an Irish one (if I had time). I love the Easter Egg shirt.. ADORABLE!! By the way, Hudson is so cute in his truck onesie!! These are all so so cute! 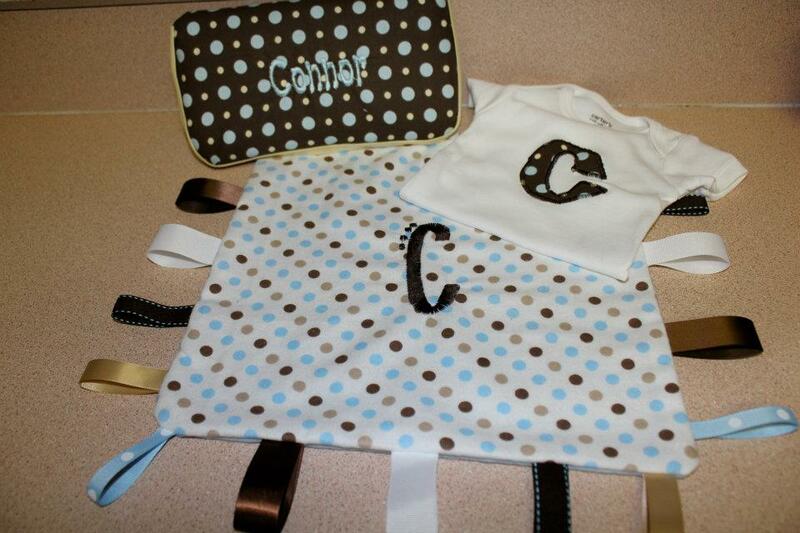 The personalized onesies are really creative and so different than others I've seen! Love Leah's work! Hudson is adorable! The truck hauling the easter egg is about the cutest little onesie ever. I'm expecting bebe #4 and all of these are just adorable. Love all of Leah's stuff! O has a few onesies and they are adorable. Of course, he can never have too many so I would love to win the giveaway! Thanks for hosting Julie and thanks for the giveaway Leah! 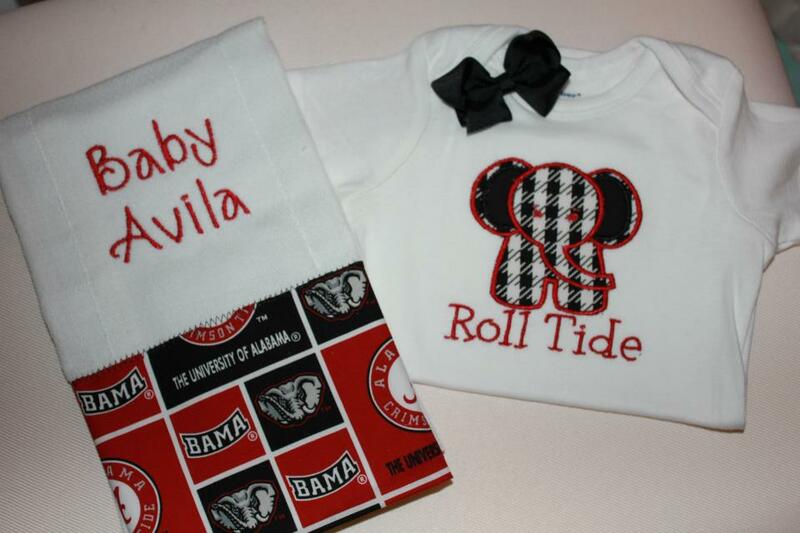 So many baby showers to attend this year . . great baby gift options. 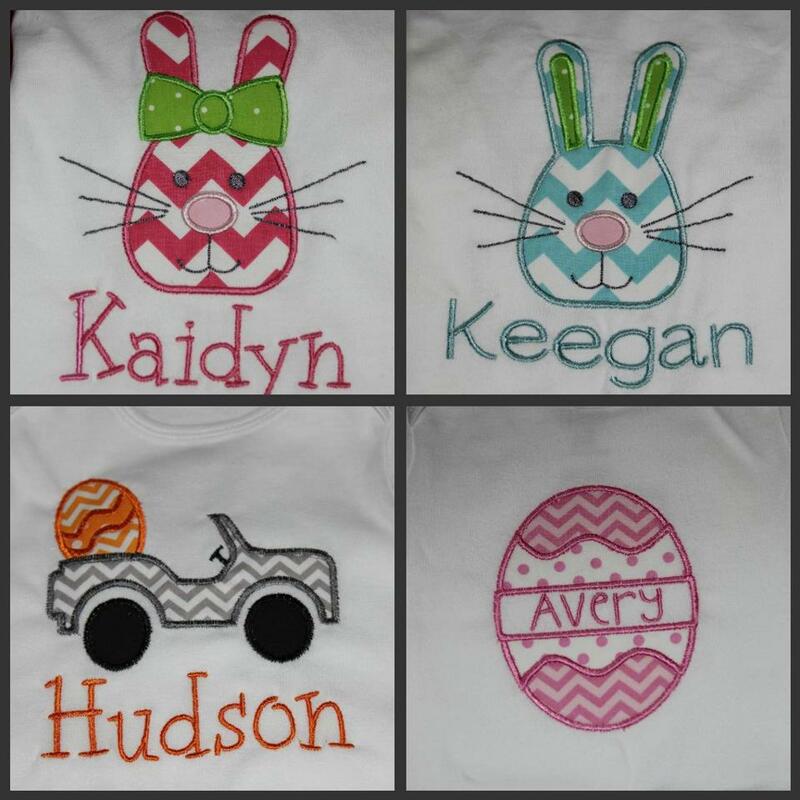 Love personalized and appliquéd clothes! I definitely need to order some things for summer. What a great shop! I love the Big bro shirt and Little bro onesie. I'm a sucker for handle bar mustaches!